This antibody was selected and evaluated immunoserologically for recombinant human TGF-alpha and synthetic (uncoupled) peptides using simple binding and competitive ELISA. 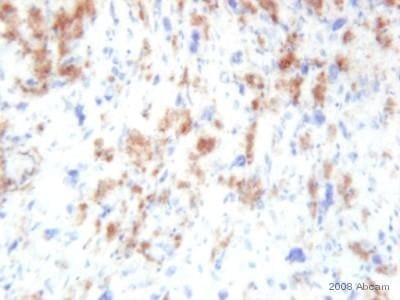 Immunohistochemical characterization of the anti-TGF-alpha monoclonal antibody was made on different human carcinomas. Recommended for immunohistochemical detection of TGF-alpha production in human tumor cells, immunoserological monitoring of progression of malignant tumours and for screening of therapeutic efficiency of different human tumors. Synthetic peptide fragment (32-40 amino acids sequence of 50 amino acids) of transforming growth factor alpha (TGF-alpha). Our Abpromise guarantee covers the use of ab9578 in the following tested applications. Immunohistochemical characterization of the anti-TGF-a monoclonal antibody ab9578 on human melanoma. Overlay histogram showing A431 cells stained with ab9578 (red line). The cells were fixed with 80% methanol (5 min) and incubated in 1x PBS / 10% normal goat serum / 0.3M glycine to block non-specific protein-protein interactions. The cells were then incubated with the antibody (ab9578, 1µg/1x106 cells) for 30 min at 22ºC. The secondary antibody used was DyLight® 488 goat anti-mouse IgG (H+L) (ab96879) at 1/500 dilution for 30 min at 22ºC. Isotype control antibody (black line) was mouse IgG1 [ICIGG1] (ab91353, 2µg/1x106 cells) used under the same conditions. Acquisition of >5,000 events was performed. Publishing research using ab9578? Please let us know so that we can cite the reference in this datasheet. 1. 10 ug was loaded onto the gel 2. According to Thornley, Biosci Rep. 12(4):293-302, endogenous A431 possess significant amount of TGF alpha. 3. Their 2nd antibody has been routinely tested with several other primary antibody such as his tag, GST and they worked well. 4. The extraction buffer they used is Intron Pro-prep protein extraction kit cat#17081. The active ingredient was not mentioned in its datasheet, but it contains 5 protease inhibitors: PMSF, EDTA, Pepstatin A, Leupeptin, and Aprotinin. If you require further info please do not hesitate to contact me. Thank you for contacting your customer and forwarding the responses to us. As I understand, the customer is using A431 whole cell lysate and loaded 10 ug. This is may be not enough for detecting the target protein on Western blot and I would suggest loading at least 25-30 ug protein per lane. It is also important to know that the customer has actually used GST-tagged protein. It may well be that the GST tag somehow blocks the recognition of the antibody. Please let me know how your customer is getting on with 30 ug protein. If there is still a problem, then please do not hesitate to contact us again. Thank you for your enquiry. We are very sorry to hear that your customer is having problem with this antibody. We would like to know some more details of your customer’s Western blot assay. 1. How much protein was loaded onto the gel? 2. Does the customer know the expression levels of TGF-alpha in the samples? Do the A431 cells high or low expression of TGF-alpha? 3. Did the customer check the secondary antibody with another primary to make sure that the detection system works properly? 4. What lysis buffer did the customer specifically use? We would strongly suggest using RIPA buffer. Preparation of RIPA cell lysates for Western Blots: 1. Wash cell pellets once with ice-cold PBS. 2. Add 1 ml of RIPA buffer to 10x8 cells, incubate on ice for 20 min, vortex 2 to 3 times. 3. Centrifuge for 5 min at 4oC at maximum speed in a microfuge tube. 4. Transfer supernatant into clean tube. Measure protein concentration with a protein assay. 5. Adjust concentration to 5 mg/ml with RIPA lysis buffer. 6. Add equal volume of 2 x SDS sample buffer into cell lysate, boil for 5 min. 7. Store at -20oC for daily use or -80oC for long term. Avoid repeated freeze thaw cycles. RIPA Base Ingredients Tris-HCl: 50 mM, pH 7.4 NP-40: 1% Na-deoxycholate: 0.25% NaCl: 150 mM EDTA: 1 mM PMSF: 1 mM Aprotinin, leupeptin, pepstatin: 1 microgram/ml each RIPA Protease Inhibitors Phenylmethylsulfonyl fluoride (PMSF) (200 mM stock solution in isopropanol; store at room temperature) EDTA (calcium chelator; 100 mM stock solution in H2O, pH 7.4) Leupeptin (store frozen in aliquots, 1 mg/ml in H2O) Aprotinin (store frozen in aliquots, 1 mg/ml in H2O) Pepstatin (store frozen in aliquots, 1 mg/ml in methanol) Finally one note, the immunogen used to raise this antibody was a synthetic peptide fragment (32-40 amino acids sequence of 50 amino acids) of transforming growth factor alpha (TGF-alpha). Therefore, we would suggest running a positive control (purified TGF-alpha) along with the samples. We look forward to hearing from you soon. BATCH NUMBER 76581 ORDER NUMBER 61724 DESCRIPTION OF THE PROBLEM No signal. SAMPLE human PRIMARY ANTIBODY 1/1000 in 3% MPBS for 60 mins 3 x wash in PBS SECONDARY ANTIBODY Abcam anti mouse IgG DETECTION METHOD TMB POSITIVE AND NEGATIVE CONTROLS USED none-TGF alpha was a postive control within assay. ANTIBODY STORAGE CONDITIONS 4?C TYPE OF ELISA Direct ELISA- target- antibody- secondary antibody COATING WELL 100 nM Native TGFalpha in PBS, doubling dilutions down plate. 60 mins coating time. BLOCKING CONDITIONS 3 % Marvel/PBS HOW MANY TIMES HAVE YOU TRIED THE APPLICATION? 2 HAVE YOU RUN A "NO PRIMARY" CONTROL? No DO YOU OBTAIN THE SAME RESULTS EVERY TIME? Yes ADDITIONAL NOTES TGFalpha used was recognised by a polyclonal ab from anohter supplier. Thank you for your enquiry and for taking your time to fill in the on-line Questionnaire. We are very sorry to hear that you are having problem with this antibody. We have searched our database and found that this is a popular selling product and your feedback is the first we have received about it not working. Therefore, at this stage, we would suggest that there is either a problem with the vial you received, or modifications to your protocol are needed to obtain a positive result. 1. Try to coat the antigen in bicarbonate buffer rather than in PBS: Bicarbonate/carbonate coating buffer (100 mM): 3.03 g Na2CO3, 6.0 g NaHCO3 (1000 ml distilled water) pH 9.6, 2. The coating time should be at least for 2 h at room temperature. 3. We would recommend testing a range 1-10 ug/ml of the antigen in 100 ul of coating buffer. 4. Blocking should be with 5% BSA for at least 2 h at room temperature or, if more convenient, overnight at 4°C. 5. Incubate the wells with the primary antibody for at least 2 hrs. 6. Have you tested the secondary antibody to make sure that detection system works properly? We hope this will help you. Should you still have problem with this antibody or need further assistance then please do not hesitate to contact us again. I would like to know which anti-TGFa antibody is best in Western blot on reduce TGF-A?? Are your monoclonals recognizing the c or the N terminal part of TGF-a??? Thank you for your enquiry and for your patience. Ab8610 recognizes the C-terminal part of TGF-a, as does ab2385. I am still waiting to hear back from the originator of ab9578 abd will contact you once I have. Can you send samples products of the TGF (ab9578) for immunocytochemistry work in diurnal grass rat Arvicanthis niloticus. We want conform this antibody in our animal, before buy the bulk amount.